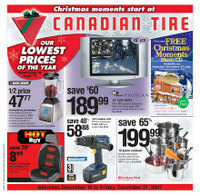 For many years, Canadian Tire has delivered a pretty thick flyer to people’s mailboxes every week. Canadian Tire also produces an email version. Yet despite what must be a huge cost to print and deliver the flyer – which often runs to over 40 pages – they keep doing it. They haven’t (yet) been tempted to drop the paper version for the much cheaper emails. It must be working for them. They must be getting a pretty decent return on investment. Email is getting clogged with spam – it’s not as easy to deliver marketing messages that way as it used to be. The paper flyer is more user-friendly. I bet people spend longer with it. They’ve been doing it for a long time and doing it consistently – a vital component in building a relationship with clients. Any other reasons? Post them in the comments.